The kitchen is the heart of every home, and an eat-in-kitchen house plan ensures that everyone in the family can enjoy the space easily and comfortably. 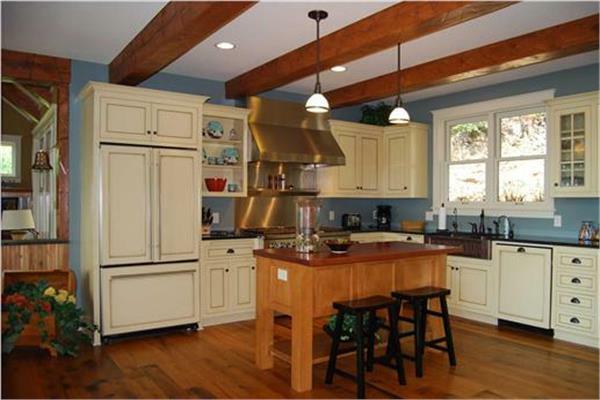 Houses that have a kitchen with an eating area included come in a huge variety of styles, shapes, and sizes. Smaller house plans without a formal dining room can include an eat-in-kitchen design that creates a cozy setting for dining any time of day. These homes typically expand the kitchen beyond the main cooking area to allow for the placement of a dining table and chairs. It’s also common to find a breakfast nook or other built-in seating area within these smaller homes. Alternately, this feature can appear in larger house styles, allowing the space to truly serve as the central entertaining area of the home. These home plans feature expansive kitchens that typically include ample counter top prep space, full-size stoves, large sinks, room for a double-sided refrigerator, and even additional cooking areas to allow for an easy meal prep flow. The eating area of the kitchen can exist as a multi-purpose center island, or the kitchen could possibly extend directly into a dedicated eating space. The versatility of eat-in-kitchen floor plans means that they can appear in practically any style of home plan, from Craftsman to Ranch. Browse through our plans below that include this feature, and find the home you’ve been dreaming of cooking in!